White non–woven washcloth products, unbeatable in delivering a true saving, which comes from their excellent cleaning performance, low price and lower consumption of cleaner. – is as performing in ink removal as the market leader and removes 15% more ink than the market leader when combined with high flashpoint cleaning detergents (above 100C°) – reduces by 15% the average consumption of cleaning detergent versus the market leader. A complete range of products for the optimal cleaning of printing presses. Non-woven washcloths delivering superior cleaning , proven to have the best performance in the industry by the laboratory testing at FOGRA , POLICLOTH products are ideal for the printers that are looking for a superior quality washcloth, able to remove up to 10% more ink than the market leader, DuPont`s Sontara.POLIWASH true savings, come not only from theexcellent cleaning performance andcompetitive prices, but also from the lower consumption of cleaning solution: up to 22 % lower that any of the competitive products. POLICLOTH Blue non-woven washcloth of superior quality. The following claims were proven true by the testing at FOGRA. 2) reduces by 15% the average consumption of cleaning detergent versus the market leader. POLIWASH White non-woven washcloth of excellent quality : The followingclaims were proven true by the tesring at the FOGRA. 2) Poliwash allows an average saving of 22% of cleaning detergent versus the market leader. Tthe evolution of wet rolls that creates a revolution in the automatic blanket cleaning Engineered for use in the automatic blanket cleaners that require wet rolls, they are also excellent when used in traditional automatic blanket cleaners, after excluding the liquid dispensing systems. 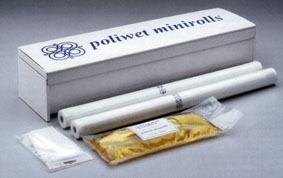 With poliwet minirolls standard the washcloth mini rolls are moistened at the moment of use: our rolls will never run dry; your blankets will be perfectly clean; and you will have no solvents in the pressroom, thus ensuring minimum impact on the environment and on operators' health (100% non VOC).